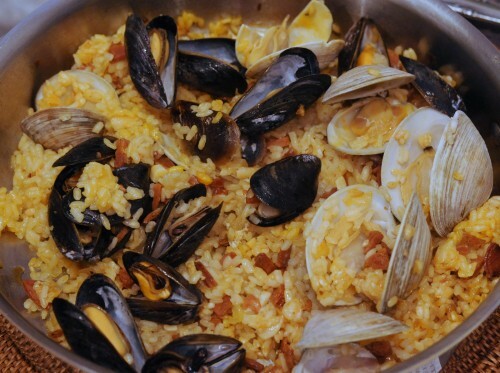 This is why I’m bringing you Paella For Two, so you can make it for a nice dinner at home with simple ingredients and a handful of clams and mussels, all in about 30 minutes. Let’s make it less intimidating so you can make it for a special dinner. Cooking begins by using a nice, deep and flat-bottomed pan, ideally a paellera but a good solid pan will do. 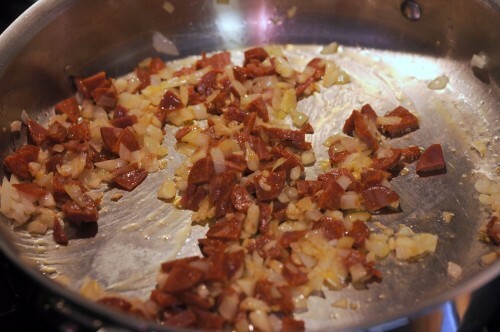 Garlic, onions, saffron and chorizo are sauteed until cooked and the colors are released into the oil. Adding the rice in early while sauteing gives it the flavor of the oil. A trick I learned from how my wife makes Arroz Caldo is to saute the rice with the onions, garlic, and oil. This allows the rice to absorb those precious flavors and make for a tastier rice dish. Broth and seafood are added. 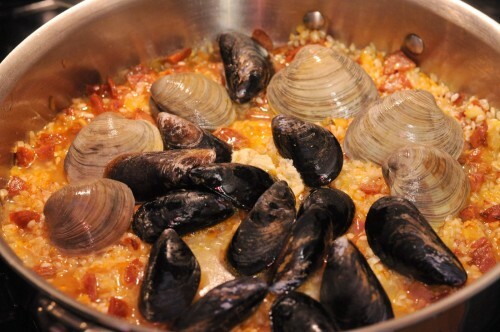 When the rice has absorbed the oil and color, you may add the clam juice or broth, as well as the clams and mussels. If using fish and shrimp, you may add those later because they take a shorter time to cook. The dish is simmered until the rice is cooked and the broth is reduced. 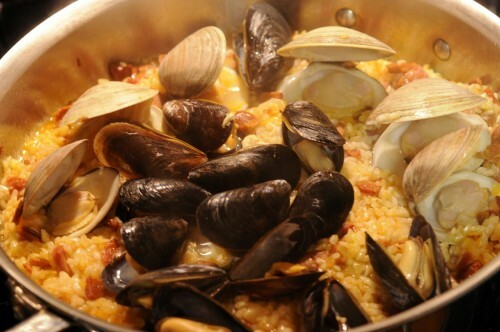 For the perfect consistency, one must keep a very close watch on the paella so that it doesn’t overcook or dry up. A little bit of broth left over is okay because it will evaporate once served. This makes a paella entree for two, or starters/sides for four. Optional toppings: sliced fish fillet, chicken pieces, shrimp, scallops, red bell peppers, parsley, etc. One may also try adding 1 teaspoon tomato paste in the broth for color and extra acid. 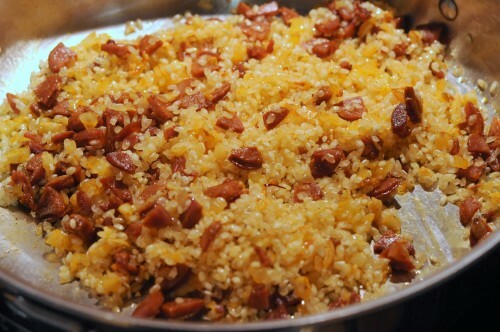 In a deep pan or paellera on medium heat, saute garlic, onion and chorizo until the oil is colored by the sausage. Add the safrron and rice and mix well until the rice absorbs the oil and the color. This is a key step that allows the flavors to seep into the rice as in my arroz caldo recipe. 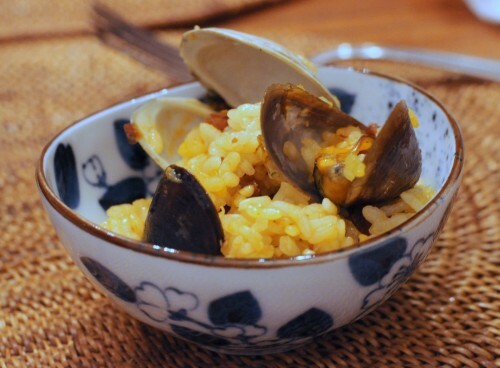 When rice is fully coated, add 1 cup of broth or clam juice and the mussels and clams (fish, shrimp or scallops should be added later, if using chicken, it should be browned along with the garlic and the onions). Simmer rice mixture on low heat for about 20 minutes, covered, mixing every few minutes to prevent the bottom from burning. When the rice has turned opaque and almost al dente, simmer uncovered, adding broth 1/2 cup at a time if necessary, for another 10 minutes or until al dente. It should not need any extra seasoning but you may add salt and pepper if necessary. A little bit of sauce left in the bottom of the pan will evaporate and keep the rest of it moist. Serve promptly.